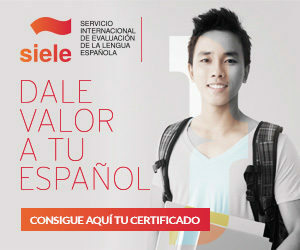 International Assessment Service for the Spanish Language. It is the most comprehensive, versatile and prestigious system for assessing and certifying Spanish language proficiency. It is a single multi-level exam that enables candidate to obtain a SIELE certificate, a document that includes score from 0 to 1000, the result added scores from each of the four tests, and corresponding levels of CEFR. a key certificate for their training and professional career paths. Reliability of SIELE exams is guaranteed by the experience of four of the most prestigious cultural and academic institutions: the Instituto Cervantes, the Universidad Nacional Autónoma de México, the Universidad de Salamanca and the Universidad de Buenos Aires. Exam management, administration and scoring is carried out via technological means, which offers simplicity, comfort and speed throughout the entire certification process. At siele.org candidates select their exam modality, Costa Rica as location and the most convenient date, at ILISA we offer sessions every Friday, all year round. After taking the exam, you will obtain a certificate or report in the same website within a period of no more than three weeks. As preparation for your exam either SIELE or DELE, ILISA offers you special courses based on the Common European Framework of Reference for Languages (A1, A2,B1,B2,C1) that would help you get ready for the examination. Before starting with your classes, we will assess your current level of Spanish in order to determine your areas of improvement. Contact us for more information spanish@ilisa.com Ph: US 727-230-0563 or CR +506-2280-0700. Enroll for the exam today!